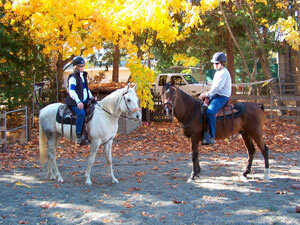 Welcome to Hands-on Horse Training. "Hands-on" is what I call my method of training horses and their owners to form a partnership based on respect and trust, while attaining physical balance and collection, which are corner stones of good horsemanship. I employ a wide range of "Classical Horsemanship" techniques. My methods are derived from personal experience, along with my studies of classical training sources and observation of, and instruction by, other accomplished practitioners of the art of training and riding horses. Much of my focus is on creating a rapport between human and equine to facilitate control and performance without the use of aggressive methods or harsh training aids. Additionally, I put great emphasis on strengthening and balancing the horse, with the goal of attaining even weight distribution and collection. Thus eliminating a great many issues caused by a horse's natural physical asymmetry. I believe the best training methods involve the owner in the process at every possible level, rather than just taking a horse away for a month or two and returning it "trained". Lasting training requires the rider to know and understand how his or her mount has been trained in order to maintain and continue with the horse's progress into the future. If you or your mount are in need of training or you have an interest in classical horsemanship, feel free to call me at 541-535-7974 to discuss your needs.